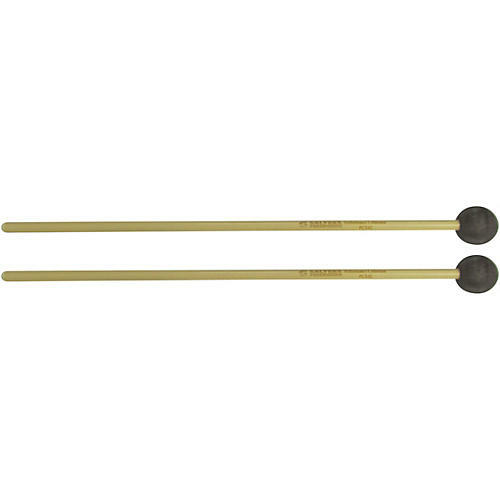 The Salyers Percussion PCX41 soft rubber mallet works well on marimba or xylophone. The rattan shafts are matched in diameter and flex. The Performance Collection unwound mallets are designed to offer a comprehensive selection of sonic possibilities to the advanced percussionist. Head sizes available are 1 in., 1 1/8 in. and 1 1/4 in. The rattan size sets this series apart from any other series available. The trend of using very thick rattan on unwound mallets results in a stiff shaft that does not allow the natural flex of rattan to help get the best sound from the keys. We use a rattan size that feels good yet flexes just enough to help you get the best sound possible from your instruments.